Buying and owning an Airstream Motorhome is a huge commitment, but one area which is often overlooked, the the subject of Emissions. Most of our Motorhomes are 20+ years old now, and dependant on which state it is registered in, you may need a smog test. If you are looking at a motorhome to buy, or are moving to another state, you will need to know. Seemed like a good idea to have a thread about smog. What the rules are in different states. What equipment is or should be on your motorhome. What modifications are allowed in your state. In short, anything that relates to smog testing and how it impacts you. I want to get the thread started by talking about the two basic emissions standards. Which state your motorhome CHASSIS was built for, decides the emissions equipment that was fitted, and how it will be tested. It is my understanding, that states cannot require a vehicle to be upgraded or changed to a different emissions standard than its original spec. Next is the year it was built. The deciding factor is what year the CHASSIS was built, not by what year Airstream put the bodywork on top. You may have a 1984 Airstream, on a 1982 chassis! The year dictates what equipment is fitted and what standard it will be judged by. The vast majority of Airstream Motorhomes were built on GM's venerable P30 chassis. Most of those are fitted with the 454ci V8, and it is this motor that will get the bulk of the attention. Those of you lucky enough to have Diesel engines feel free post too! For the record, until 1990, all of these 454 V8's had a 4 barrel carbureter. Normally a Rochester Quadrajet. 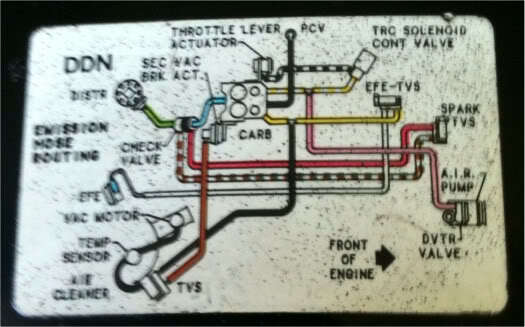 The carbureter was a E4MC, or a E4ME. The only differences between these two is cold start choke mechanism, with the C using air temperature choke, and the E using Electric choke. No computer, no catalytic converters, and no O2 Sensors. In 1991, the 454 was fitted with GM's Throttle Body Injection(TBI), which is computer controlled, and has a Catalytic converter, and O2 sensor. Because of the way that the 1991 and later models are set up, with interlinked systems and Check Engine Lights(CEL), they are less often messed with or modified. It also has a basic diagnostic system and can be checked via the ALCL port under the dash. For now, lets look at the earlier models. 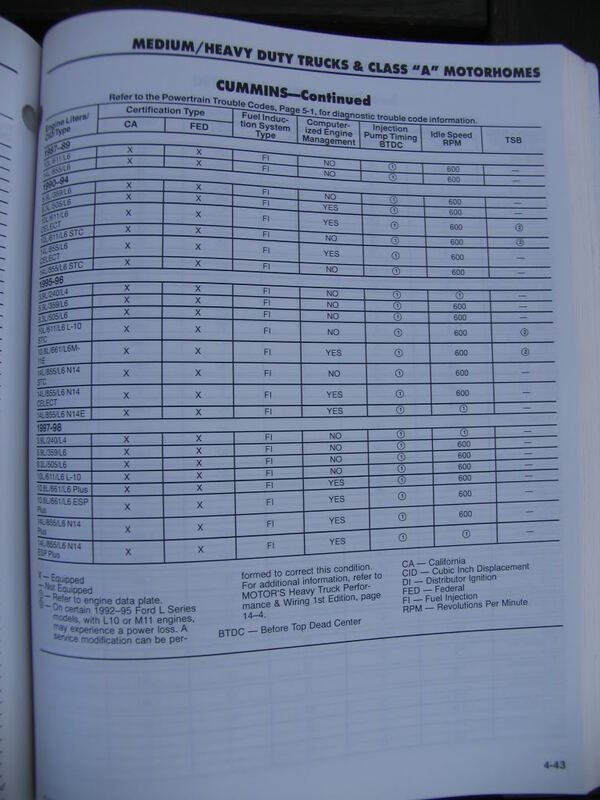 Here is a glossary of emission control equipment fitted to the pre 1991 454ci V8's, and what each is, and does. Keep in mind, most of these systems are simple. Most are driven and controled by temperature sensors, and engine vacuum. Thermostatic controled air filter, also known as Thermac. The lower body and snorkle of the air filter has several devices to sense the temperature of the engine and the ambient air. Air Injection System. Uses one or two air/smog pumps and pipework to inject air into the exhaust manifolds. Early Fuel Evaporation System. Vacuum driven butterfly valve normally on the drivers side exhaust manifold used to speed engine warmup by redirecting hot exhaust gasses under the intake manifold. Exhaust Gas Recirculation. A valve on the intake manifold that recirculates exhaust gas into the intake to lower emissions. Evaporative Emissions Control System. Normally a series of pipes and valves leading to canister filled with charcoal to absorb fuel vapors, and later allow the engine to draw in and burn them. Spark Control System. Senses engine speed and temperature to adjust ignition timing and emissions equipment. Thermostatic Vacuum Sensor. Vacuum valve that senses either air or coolant temperature to adjust or direct vacuum. 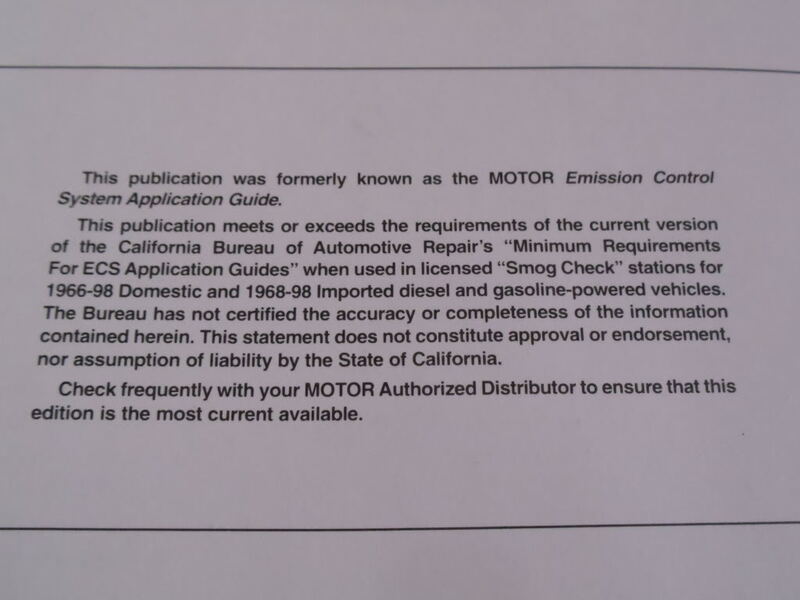 For California, Gasoline powered Motorhomes are subjct to emissions testing if they were produced AFTER 1975. Diesels are emissions test exempt until 1998. The test involves two steps. A visual inspection, and the actual emissions test. The visual inspection involves them checking that the vehicle has ALL of the emissions equipment that it was manuafactured as new with, and that everything is functional. There is some flexibility, but only if it does not effect the emissions. A good example would be changing the intake manifold for a better design, but it would have to be a approved item with a CARB number to pass. Banks Power kits fall under this exception, and are fully approved. They also are allowed to select a component for testing if they are concerned that it is non functional. Wrong carbureter.. fail. Missing smog pump.. fail. The smog station needs to check and confirm what year and state the chassis spec is. The first step is to check the Emissions sticker that is normally on the Air Cleaner body. They are looking for something like this one from a 1984 Airstream 310, Federal spec. There should be another label, but I cannot find a good example of it at this time. They also use a book similar to this one to reference what equipment should be fitted. 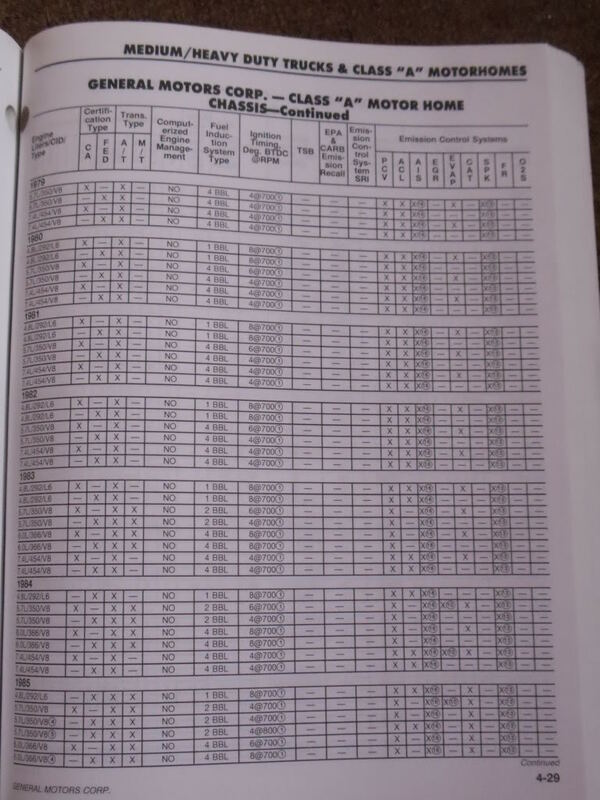 The section that covers Motorhomes on GM chassis looks like this.. If the vehicle passes the visual test, they use the book details to check ignition timing, and if this is correct, they test the vehicle at idle and at about 2000rpm with an exhaust probe. The actual emissions level are variable by county and year. Sure glad I live in Georgia. No emissions requirements for anything over 8000lb GVW. You need Diesel Emissions testing along the front range of Colorado annualy for any diesel vehicle over 10 years old and over 14,000 lbs every year. The full counties of Boulder, Jefferson, Broomfield, Denver, and Douglas, and the partial counties of Adams and Arapahoe, Larimer, Weld, and El Paso. Prices vary but they can charge up to 1 hour of their normal shop rate. I pay about $100. The heavy diesel stations are not as convenient as the regular vehicle emissions testing stations and you have to make an appointment. They do run the heavy vehicles on a roller dynomometer. My 95 360 Classic passed the first year but was pretty close. Shortly after that I installed the Banks Power Pack which visibly helped with the opacity and passed with flying colors last year. They didn't have any problems accepting the modifications I did. You can look on my Banks installation thread in this forum for more information. 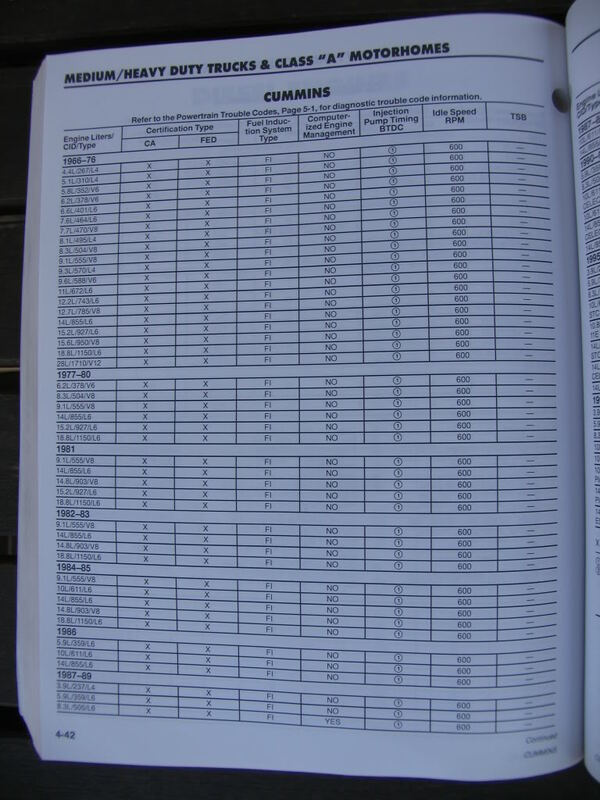 Here is an example of the test form. Left side was this year, Right side was before the Banks install. Kentucky, no emissions testing, period. Man do I love the simplicity of a mechanical diesel. On top of that we don't have inspections anyway. Life is great. I hope it's OK to gloat a little. Life is great. I hope it's OK to gloat a little. I hope so cause I'm gloating right along with you! Yup, I bet you guys are! Thats the whole point of this thread! I knew I would have to smog the AS, or was prepared for it. What I didnt know was how difficult it is to find out what equipment was originally fitted and how it functions. Once I found out, cross referencing the parts to other models. I have spent time looking at diagrams, photographing trucks at the junkyard and making sketches. Now I think I have it all figured out. 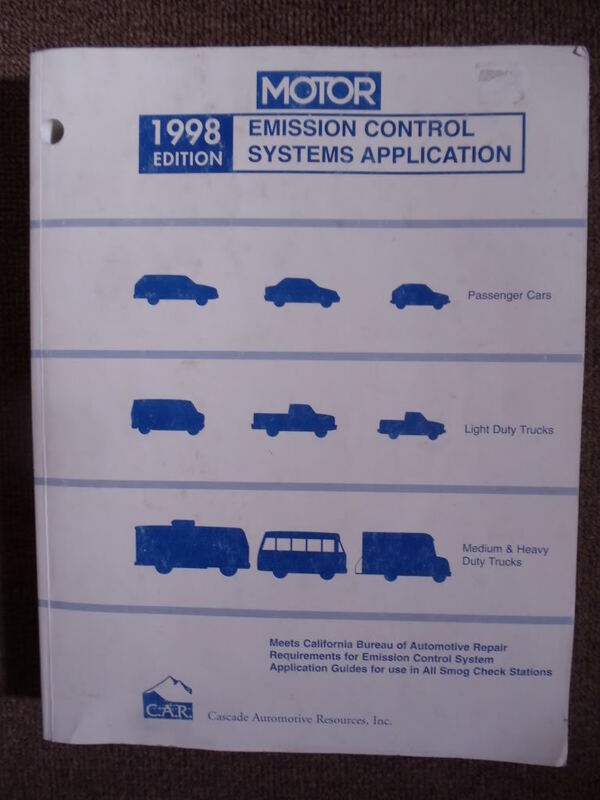 For example... the 1984 Federal Motorhome has no EGR... that one thing changes the vacuum pipe configuration. This week I will lay out all the parts I have in their correct order and take some photos. Keyair even that doesn't apply. 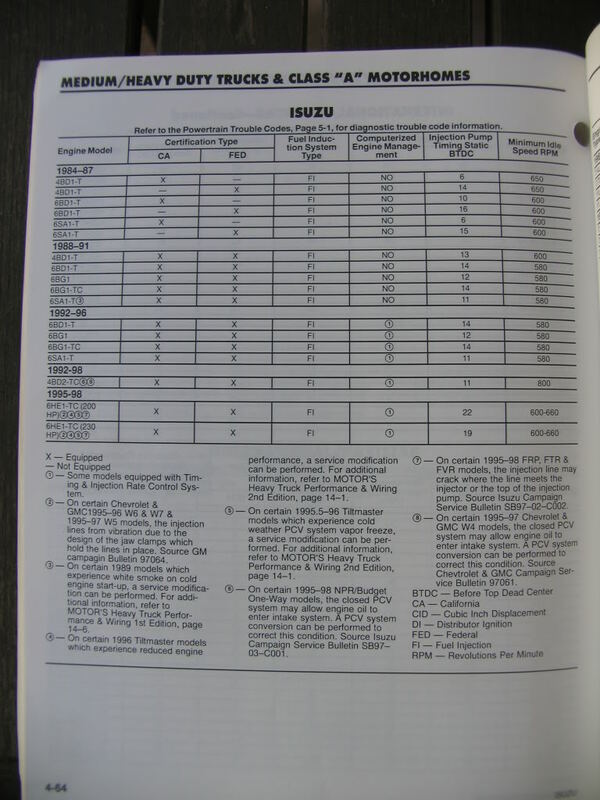 The 84-87 Isuzu's listed are all turbo charged. The Isuzu's Airstream used were normally aspirated and then an aftermarket low pressure BAE turbo was installed. Mine is an 81 chassis anyway. It would be interesting to know what Airstream was thinking when they built these coaches. I am lucky enough to own a little property in Montana. No emissions testing, and there is a cottage industry that revolves around forming corporations for individuals who want to register their RV's there. I bought our 310 with California smog equipment on it. If I ever get to stay where it is parked long enough, what is involved with removing all of that stuff? My particular concerns are adjusting the carb and the little pipes that are pulling exhaust out of each of the header pipes. I recently "de-smogged" a 1985 305 CID Chevrolet engine and determined that it was counterproductive as to performance and was costly to boot! I would be more concerned with the issues of E-10 fuel in older gas engines. I do have a 1993 P-30 MH that was sold new in California and I really don't have any issues with the smog controls. A really good tune-up is worth the money on a 454 CID engine.